Keilor Park, home of the Star Weekly office, is on the edge of a sprawling area of inter-connected industrial estates hugging Melbourne Airport. 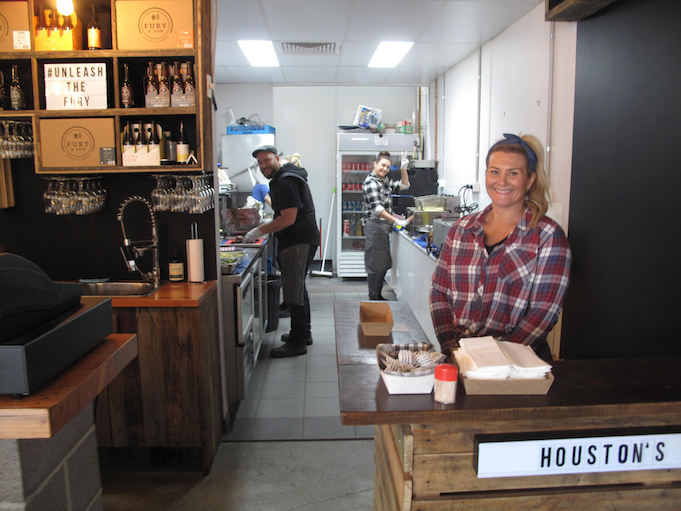 Around here, there appears to be a tradies-style cafe on almost every block. One of our locals, for instance, has rotating bain marie offerings of beef vindaloo, satay beef, beef ragout and so on. And they all taste the same. In this place I have seen a beefy trucker gleefully tuck into a vast bowl of super-rich cream sauce with a pasta garnish – all gracefully topped (covered) by a hefty chicken schnitizel. Such grotesqueries are not uncommon around here. As previously noted here at CTS, no matter how much such operations may wish it to be otherwise, in most cases they simply must do the potato cake and dimmie routine. That’s why myself and a handful of colleagues continue our weekly curry run to get wonderful Sri Lankan goodies from Spicy Corner in slightly further afield residential Tullamarine. And that’s why I and most of my Star Weekly colleagues pack lunches – in my case, especially earlier in the week. And that is also why the opening of a bona fide barbecue joint just around the corner from our office – a two-minute walk, no need to get in the car – seemed so surreal. 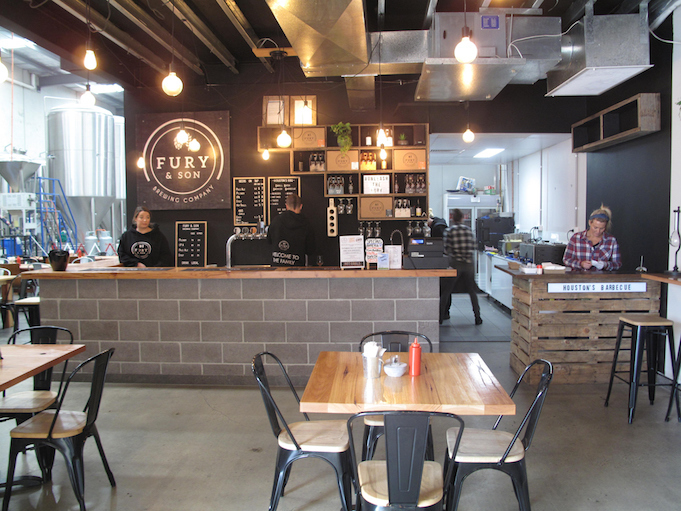 Houston’s Barbecue is located in the premises of Fury and Son Brewing Company. And it’s open only on Fridays. Of course, I was VERY interested in checking it out – for both CTS purposes and as a break in the Keilor Park eats routine. However, initial visits – several months ago now – left very mixed impressions. 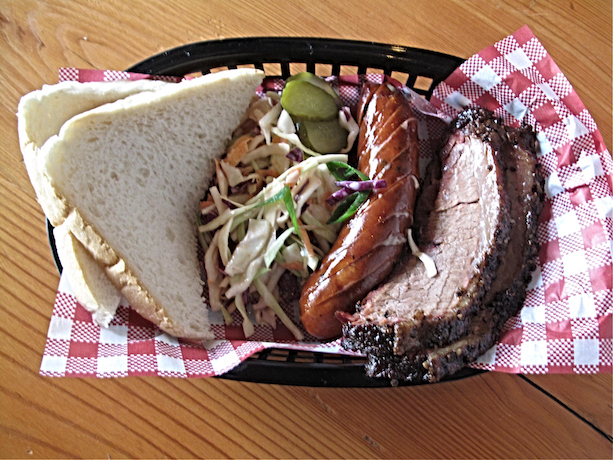 For example, brisket burgers and beef hot dogs that were OK – but not really nailing it. This is a new operation – a very unique one, operating in an unusual (to say the least) location. There had to have been doubts about whether it would even draw sufficient numbers, especially at Friday lunch-time, and about what would or would not work. Some fine-tuning, tweaking and settling-in time has definitely been in order. I returned a couple of weeks ago – and was mightily impressed. The menu has been constantly revised. For the in-a-hurry, keep-it-cheap lunch crowd, there are still burgers and punters can still customise meals by ordering 100-gram meat portions and sides. 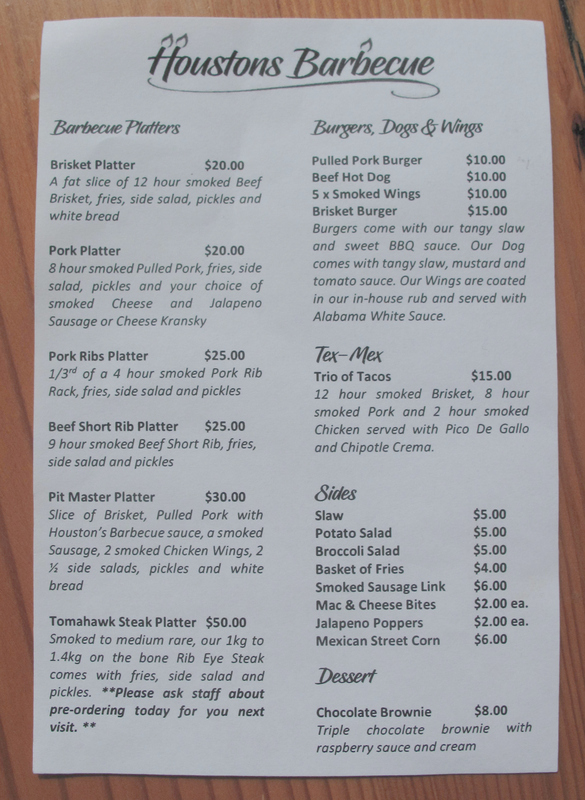 But the introduction of substantial – and, yes, pricier – platters has seen Houston’s Barbecue reach new heights. Heights that deserve to make it a destination for a wider audience than merely those who work nearby. Two hunka-chunka slices of wonderful spicy-crusted brisket. An excellent cheesy, greasy smoked sausage. Just the right amount of good coleslaw and pickles. And – oh, yes! – none of that brioche nonsense; instead, two slices of perfect white, sliced bread in true barbecue joint fashion. Entirely delicious – and worth every cent of the $18 I paid. Returning a week later, I have an even better time. The menu has changed again (see latest incarnation below). For CTS purposes, I am happy to splash out in a way I hope doesn’t become too much of a weekly habit! This beef short rib conglomeration costs $25 and it’s a doozy! The chips are just OK – maybe less crisp and hot than I would like on account of me being the day’s first customer. Slaw and pickles as previously enjoyed. And I would’ve appreciated that white, sliced bread again – and as seen on new photos on the Houston’s Barbecue Facebook page with this platter. But forget all that – what about the meat? My single, hefty rib is amazingly good. Less fatty than many barbecue beef ribs I have eaten, it’s meat is tender, plentiful and heavenly. The spicy crust might be too salty for some tastes, but I love that as well. As for doubts about the commercial viability of the singular location and one-day-a-week opening hours, I couldn’t be happier to observe that Houston’s Barbecue is a hit. 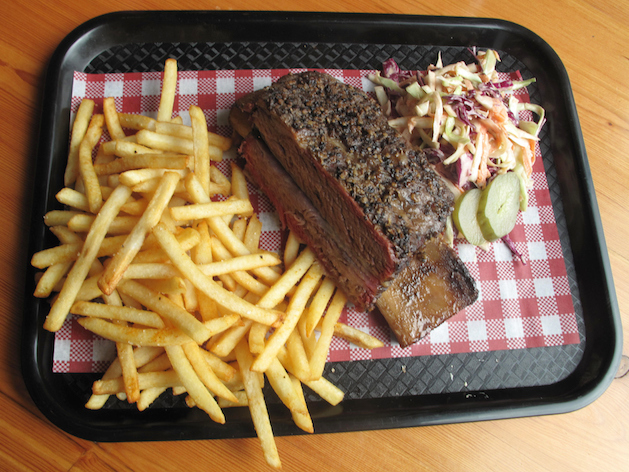 Houston’s Barbecue is open on Friday from noon until 10pm – or until sold out!